After years of taking advantage of hotel guests and tenants, Wealthy Uncle Moneybag's financial empire has crumbled into forclosure. The millionaire's lavish property must be sold off to satisfy his debts, and you are one of the creditors! You may not need a diamond-encrusted watch or a rare fossil collection, but with 2-6 creditors sniffing around, maybe you should just take all you can grab? 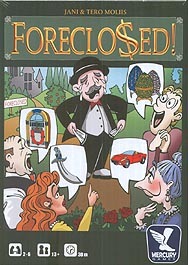 Playing a round of "Foreclosed!" is simple, but the strategies are endless. Each turn, you'll be awarded a single item from Wealthy Uncle Moneybag's outrageous collection. If you receive some expensive silverware which you're not interested in collecting, and another player has received the fancy automobile you had your eye on, just make that player an offer. If the other player wants to keep their item, they'll be forced to "protect" it by paying more money than you offered them. If a player does not have enough money, or does not want to spend the money they have, they must accept your offer. Once all player had had a chance to make offers, the round ends and all acquired items are added to their new owner's collection. Sometimes you will find it is just as rewarding to force other players to spend their money protecting items you didn't really want in the first place!